Awesome! 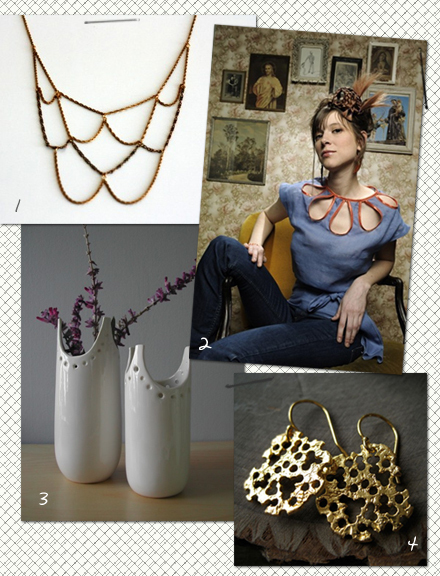 I love these....particularly that fab necklace and those beautiful vases! I love the Creole Top! I'm going to look at her stuff right now. lol. I am so loving that blouse! Etsy is dangerous... and so are bloggers like you that point out these things! What a sweet collection of pretties this is! what an awesome quartet. i love all four. That,s marvelous specially vases that look pretty decent. thanks marichelle, you always assemble the prettiest posts! wow. the gilded necklace made from a mix of vintage chains is so clever!! pretty decent look specially Gilded Era Necklace and Vases is so cool.